PRRT2. This is the Epilepsiome page for PRRT2, the most common genetic cause of Benign Familial Infantile Seizures. Even though PRRT2 was only discovered in 2011, mutations in this gene have already been found in more than 1000 reported patients. Mutations in PRRT2 can cause infantile seizures and/or movement disorders. Structure of the PRRT2 protein generated with Protter (Omasits et al., Bioinformatics. 2013 Nov 21.) PRRT2 is a presynaptic protein involved in vesicle fusion. PRRT2 interacts with SNAP25, a member of the SNARE complex. Mutations in the PRRT2 gene are the most common cause of benign familial infantile seizures. In a nutshell. PRRT2 is the long-sought gene for Benign Familial Infantile Seizures (BFIS), an infantile, self-limiting epilepsy that is often characterized by focal seizures. PRRT2 is also associated a genetic movement disorder referred to as paroxysmal kinesogenic dyskinesia (PKD) and a combination of both phenotypes called Infantile Convulsions with Choreoathetosis (ICCA). A single recurrent mutation in PRRT2 accounts for almost 80% of cases. Phenotypes. There are three major groups of PRRT2-related phenotypes, namely Benign Familial Infantile Seizures (BFIS), Paroxysmal Kinesogenic Dyskinesia (PKD), and Infantile Convulsions with Choreoathetosis (ICCA). In addition, about 5% of PRRT2 mutation carriers have atypical phenotypes including various movement disorders, epilepsies, hemiplegic migraine, and developmental delay and intellectual disability. Reviewing the literature of published cases, Ebrahimi-Fakhari and collaborators found that both BFIS and PKD account for roughly 40% of published cases, ICCA has been reported in 15% of reported families and other phenotypes were present in 5% of patients. Benign Familial Infantile Seizures (BFIS). PRRT2 is the gene for Benign Familial Infantile Seizures, a familial seizure disorder inherited in an autosomal-dominant fashion. Children with Benign Infantile Seizures (BIS) have clusters of focal seizures or generalized tonic-clonic seizures between the ages of 3 and 12 months typically, often prompting a complex work-up in order to exclude other etiologies. This condition is also referred to as Watanabe Syndrome. Herpes encephalitis is one of the most important underlying conditions to be excluded. Seizures are usually self-limiting and remit in the second year of life. Patients with benign infantile seizures typically have an unremarkable development. Most families with BFIS carry mutations in PRRT2. Recently, some families with a recurrent mutation in SCN8A have been described. Paroxysmal Kinesogenic Dyskinesia (PKD). PRRT2 was initially identified in paroxysmal kinesogenic dyskinesia, which is characterized by brief attacks of hyperkinetic movements precipitated by sudden movements. These brief attacks consist of dystonia, chorea and athetosis, which often occur in combination. For example, patients may have a brief attack of involuntary movements when suddenly rising from a chair. It has been noted for quite some time that PKD can be treated with anti-epileptic medications, which had initially raised some suspicion whether at least some component of this condition may be due to hyperexcitability. Carbamazepine and oxcarbazepine are the medications that are typically used. PKD is inherited in an autosomal dominant fashion and PRRT2 is the only gene associated with PKD so far. There are other familial movement disorders such as Paroxysmal Nonkinesogenic Dyskinesia (PNKD) or Paroxysmal Exercise-induced Dyskinesia (PED) that have different genetic causes. Infantile Convulsions with Choreoathetosis (ICCA). The combination of infantile seizure and paroxysmal kinesogenic dyskinesia has long been noted in families and this condition had been historically referred to as Infantile Convulsions with Choreoathetosis (ICCA). In principle, ICCA refers to the combined occurrence of PKD and BIS in individuals and in families. Again, most of these families have mutations in PRRT2. Other phenotypes. Some patients with hemiplegic migraine and other forms of epilepsy have been described, but these phenotypes are rare. Epileptic encephalopathies have been reported in individual patients with biallelic PRRT2 mutations. However, these patients are too infrequent to get a full picture of this condition and to assess whether these biallelic mutations are causative. Genotype. Mutations in PRRT2 causing BFIS, PKD, or ICCA typically result in haploinsufficiency and more than 70 different mutations have been described. By far the most common mutation in PRRT2 is the c.649dupC frameshift mutation that accounts for up to 80% of all causative PRRT2 mutations. This mutation c.649dupC; p.Arg217Profs*8 leads to a premature stop coding, disrupting the PRRT2 protein. This mutation is a mutational hotspot as it is located in a stretch of four guanines (G), which are followed by nine cytosines (C). It is assumed that the DNA polymerase “slips” during replication due to the secondary hairpin structure of this stretch, generating this insertion of a single cytosine. Historically, the cytosine stretch was also a reason why PRRT2 was discovered this late – this cytosine repeat is notoriously hard to sequence and might have been missed by many candidate sequencing studies in the 16p11.2 region. Historically, the linkage of BFIS to the chromosomal region harboring PRRT2 had been studied at least a decade prior to the discovery of the PRRT2 gene. Mechanism. The PRRT2 protein is a presynaptic protein (proline-rich transmembrane protein 2) interacting with members of the SNARE complex, namely SNAP25. The SNARE complex is involved in synaptic vesicle fusion and forms the minimal fusion machinery that allow synaptic vesicles to fuse with the plasma membrane. What sounds like a trivial cellular task is actually a complex biological phenomenon. Both vesicles and the presynaptic membrane are lipid bilayers that repel each other. The synapse uses torsion of the proteins in the SNARE complex to overcome this hurdle – basically, the vesicle is pulled so close to the membrane that it eventually fuses. The role of PRRT2 in modulating this process is unknown. 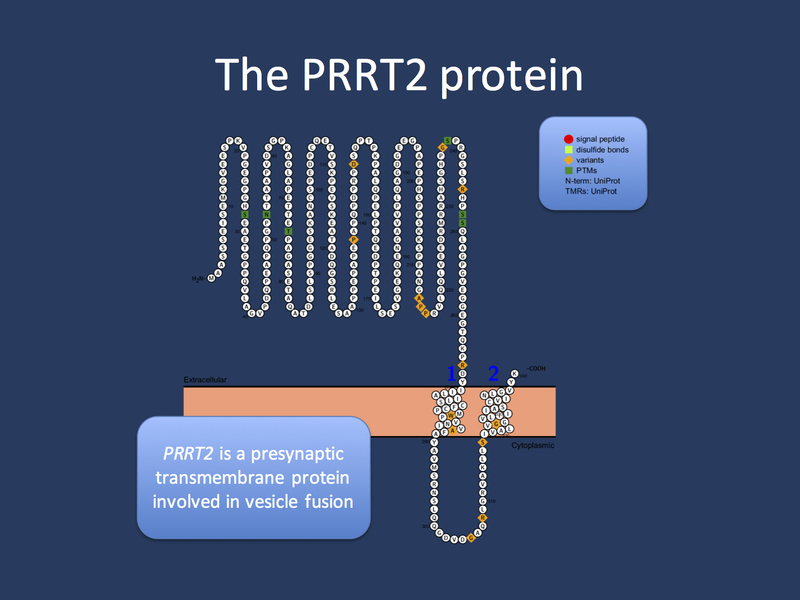 PRRT2 is a transmembrane protein located in the presynaptic membrane and is thought that it interacts with the vesicle cycle in several ways. First, it may act as one component of the SNARE complex itself. Secondly, it is involved in vesicle recycling. Third, it may have a role in regulating the presynaptic ion channels that trigger the vesicle release. Precision medicine. There is some data that suggests that PKD is responsive to carbamazepine and oxcarbazepine. It is currently not known whether this favorable response is limited to the PRRT2-related movement disorders or whether it also applies to infantile seizures. In the vast majority of cases, the epilepsy in PRRT2 mutation carriers is self-limited. Areas of uncertainty. There is a lot that we don’t know about the PRRT2 protein and the phenotypes associated with mutations in this gene. First, despite some initial evidence, the role of PRRT2 in the presynapse remains largely unclear. It is not well understood how a protein involved in synaptic vesicle exocytosis with a prominent role in glutamatergic synapses leads to hyperexcitability resulting in seizures. Likewise, the age-dependent effect with self-limiting seizures in the first year of life is unexplained. Community. There are currently no patient organizations specifically for patients with PRRT2 mutations. The dystonia page by the National Organization for Rare Diseases (NORD) lists several patient organizations for patients with movement disorders that may serve as a contact for families with PRRT2 mutations.